CHICAGO, ILLINOIS, 2018-Oct-25 — /Travel PR News/ — Today (October 23, 2018), the Chicago Department of Aviation (CDA) , representatives from Sister Airport Beijing Capital International Airport (BCIA) and Choose Chicago joined CDA representatives for the unveiling of a new photo exhibit at O’Hare International Airport. The exhibit, consisting of 24 panels, is on display in O’Hare’s Terminal 5 International Arrivals Hall and features images of BCIA as well as various famous sights and landmarks in Beijing. The new exhibit, now on display through the end of November, complements a wide collection of public art at O’Hare that is viewed by millions of O’Hare travelers from all parts of the world each year. 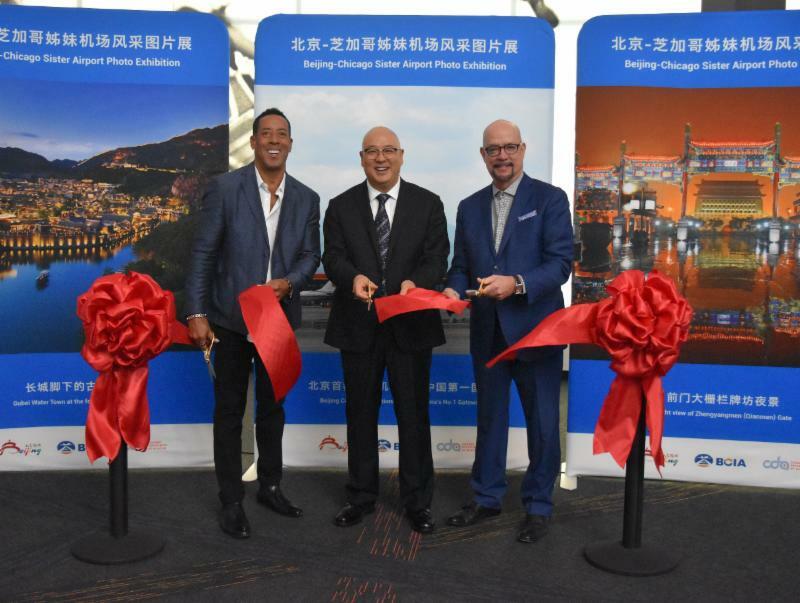 Rich Butler, Acting First Deputy Commissioner, CDA; David Whitaker, President and CEO of Choose Chicago, the City of Chicago’s tourism and convention bureau, and a delegation from Beijing led by DU Qiang, Vice President, BCIA also participated in the event. Choose Chicago is the official destination marketing organization for Chicago, Illinois. This exhibition, part of a reciprocal initiative, follows the BCIA exhibit in Summer 2017, which featured iconic images of Chicago and O’Hare Airport on display for viewing by an international audience. The photo exchange is another example of a growing partnership between the Cities of Chicago and Beijing, and ORD and BCIA which have been Sister Airport since 2011. ORD has articulations a total of 10 Sister Airports, allowing Chicago to share in aviation best practices with international partners and leading airport systems. The relationship between Chicago and its Sister Airports and global partners will continue to grow as O’Hare is modernized through O’Hare 21 and an unprecedented $8.5 billion terminal expansion plan that will enhance Chicago’s gateway to the world and leading international connectivity. This entry was posted in Airlines, Airports, Arts and Culture, Festivals and Events, Travel, Travelers and tagged BCIA, Beijing, CDA, David Whitaker, DU Qiang, O'Hare International Airport, photo exhibit, Rich Butler. Bookmark the permalink.